Dressed in Dolores Huerta-inspired T-shirts while chanting “Si Se Puede,” students from Fontana Unified’s Dolores Huerta International Academy welcomed Huerta to campus on April 15 to celebrate her 89th birthday. Students showcased dancing skills while holding flags from different countries, showing what it means to be a part of an international academy, and performed a skit about Huerta’s life as an activist. 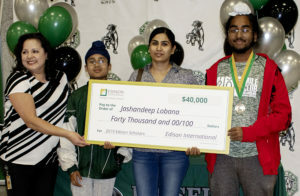 Henry J. Kaiser High School senior Jashandeep Lobana – a scientifically curious scholar-athlete and avid volunteer – has been named a 2019 Edison International Scholar, receiving a $40,000 scholarship toward his pursuit of a college degree. 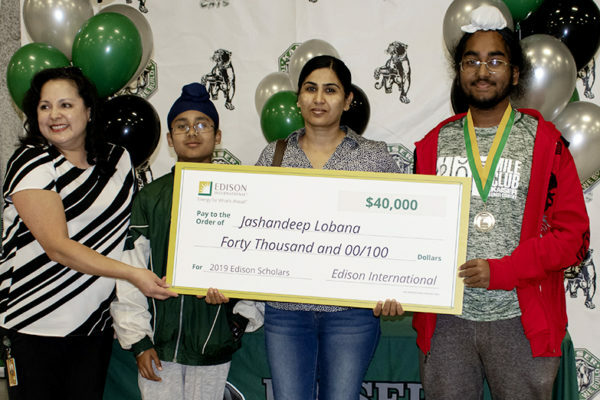 Lobana was surprised with the scholarship by his family, Edison representatives, district officials and Kaiser educators during a March 26 ceremony. A.B. 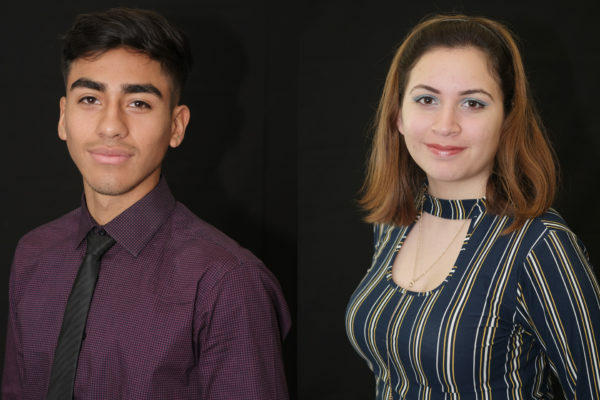 Miller High School seniors Maritza Padilla and Gerardo Pena have been named 2019 Dell Scholars, an honor that comes with $20,000 scholarships. Padilla and Pena, who both belong to A.B. Miller’s Advancement Via Individual Determination (AVID) college-readiness program, will also receive laptops and textbook credits. The Fontana Unified School District is the second-largest district in San Bernardino County, operating 45 schools that serve students from preschool through adult education in a diverse urban/suburban environment. Fontana’s schools are recognized nationwide for their fast growth in student achievement. A.B. 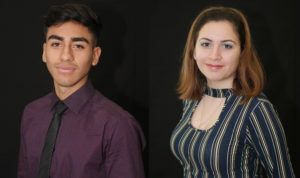 Miller High School seniors Maritza Padilla and Gerardo Pena were named 2019 Dell Scholars by the Michael and Susan Dell Foundation, an honor that comes with a $20,000 scholarship. Padilla and Pena, who both belong to A.B. Miller’s Advancement Via Individual Determination (AVID) college-readiness program, will also receive a laptop and textbook credits. Fontana Unified student filmmakers prepared classmates for prom season with public service announcements (PSAs) highlighting the dangers of underage drinking and driving as part of the District’s 2019 “Be Smart, Party Safe and Sober” campaign. Fontana Unified administrators – partnering with Fontana city and district police departments and business and community leaders – kicked off the month-long campaign at a March 27 press conference by screening the top five student-produced PSAs, which visualized the impact drunk driving can have on their future. As an Advancement Via Individual Determination (AVID) student, A.B. Miller senior Maritza Padilla understands that she and her classmates greatly benefit from increased access to resources that establish a pathway to higher education. 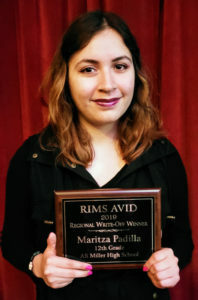 Padilla was recently selected as a regional 2019 AVID Write-Off essay contest award winner. Writing on the topic of free college tuition, Padilla was honored at the 20th annual AVID Write-Off awards ceremony, held March 21 at the California Theater of Performing Arts in San Bernardino. A.B. Miller High School’s Rebel News won first place in the news broadcast category – as well as an audience favorite award – at the New Optics Film Festival on March 16, highlighting the strength of the school’s television production program. A panel of industry professionals judged and awarded the top three videos, submitted by high school students, in five categories. Summit High School students Leslie Madrigal and Brian Garay and Almeria Middle School student Alyha Madrigal are heading to the History Day California competition, Friday, May 10 to Sunday, May 12, after taking first place in the senior group exhibit and junior individual exhibit categories, respectively, at San Bernardino County History Day. Fontana Unified will offer its sixth Parent University workshop of the year, continuing its efforts to boost family engagement in the educational process. The free sessions will provide parents with insights into the Local Control Accountability Plan (LCAP) and will be held from 9 to 11 a.m. and from 6 to 8 p.m. Tuesday, March 26 at the John D. Piazza Center, 9680 Citrus Ave. Translation services will be available. Dolores Huerta International Academy (DHIA), in partnership with California Assemblymember Eloise Gómez Reyes, will host civil rights leader Dolores Huerta for her 89th birthday celebration at 10 a.m. Monday, April 15. 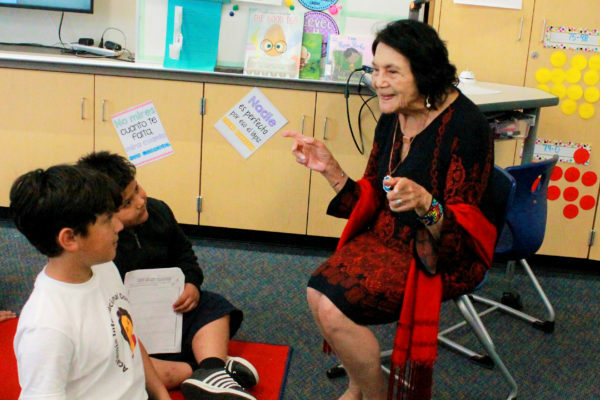 DHIA, Fontana Unified’s state-of-the-art Spanish dual-language magnet school, was named after Huerta to honor her activism on behalf of farmworkers, immigrants and women. The academy is at 17777 Merrill Ave., Fontana. 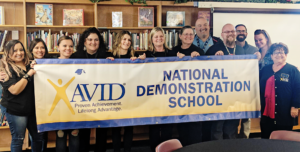 Sequoia Middle School has been named an Advancement Via Individual Determination (AVID) National Demonstration School, reflecting its thriving college-going culture and strong academic curriculum.